Welcome To The John Hardy Company Web Site. The John Hardy Company manufactures and distributes world class microphone preamplifiers and other signal processing products for recording professionals, broadcast applications and project studio engineers. The audio circuitry, components and construction methods employed in all John Hardy products are simple, elegant and superior. The most popular product, the M-1 mic preamp, has been impressing artists, engineers and listeners around the world since 1987. Typical comments include "Whoa! ", "Even the producer could tell the difference!" and "I won't record without them!" I hope you enjoy your visit. If you have any questions, comments or concerns, please don't hesitate to contact me. If you would like to receive a printed information package by mail, let me know. I would be happy to send one to you. Thank you. October 16, 2013: In January of 2013, manufacturing of the 990 was converted from through-hole assembly to surface-mount assembly. Many improvements in components were made. 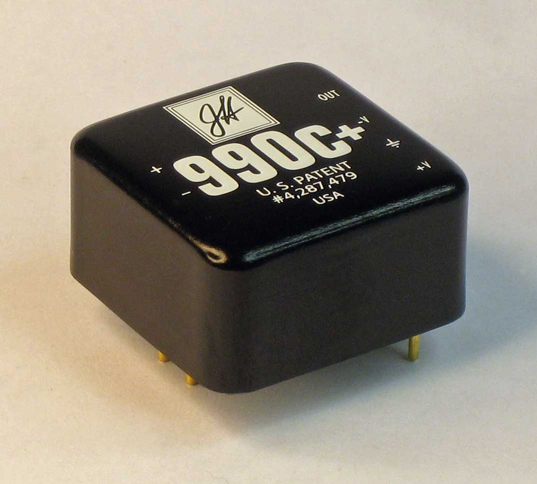 The basic circuit and package dimensions remain the same, but the name has been modified to "990C+" to signify the changes. See the 990 data package for details. May 22, 2011: Please visit the YouTube channel for the John Hardy Company to see an interesting series of videos. I hope you enjoy them. All of these videos were recorded and edited by Chris "Godxilla" Taylor, formerly of Madison Media Institute where he was Lead Instructor, Recording and Music Technology. Chris is an Avid Certified Pro Tools Expert, recording engineer, proud owner of a 4-channel M-1 mic preamp and all-around force to be reckoned with. He can be contacted directly here. Site originally designed by John L Rice. Updated by John Hardy. ©1997-2018 by The John Hardy Company - Unauthorized Use Prohibited!